Thank you for your interest in Chashama’s Space to Present Program. This application form is specific to the venue One Brooklyn Bridge Park (actual address: 360 Furman St., on the waterfront side of the building). Please read all the notes about this space before submitting your proposal. Please do not submit the same proposal to multiple spaces. Apply to your top choice and indicate on that form the other spaces that you are interested in. This space is best suited to lively, interactive exhibits that will engage children, but anyone may apply. Performance will only be considered if it includes a strong, visual component that will remain installed in the space for the duration of the time slot. This space is available for 4-week time slots. The space is approximately 1,200 sq. ft. of exhibition space and a well-sized bathroom that doubles as storage. The ceilings are approximately 10' at the highest point, and 8' at the lowest. Nothing may be hung from the ceiling or from any building fixtures, except with special permissions and planning. The space is outfitted with track lighting and HVAC. Not all proposals can be programmed and we are unable to respond to all applicants. You will be contacted only if your proposal is accepted or if we have additional questions. 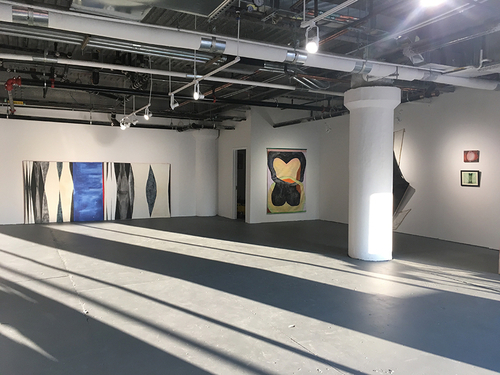 In all of Chashama's Space to Present locations, any work visible from the street (through windows, et cetera) must be appropriate for all ages. This venue requires a refundable $200 deposit for the use of the space. Exhibitors are responsible for scheduling and staffing 30 public open hours per week during warm weather months (15 hours during cold weather). We can connect you to a list of potential gallery sitters, but they must be paid at least minimum wage ($15/hr in NYC). Exhibitors are fully responsible for the installation and deinstallation of their presentation and for setting up any technical equipment or displays for their own presentations. Chashama does not provide hanging materials or tools. Exhibitors are responsible for leaving the space as they found it; Chashama provides materials for restoration. At least 5 images of work (.jpg, .png, .tiff) that relate to the proposal. If proposal is for a site-specific installation, one of the 5 images should be a layout sketch. For video work, include 5 stills and a link to externally-hosted videos. For group shows, include at least one image for each artist included.